I’m yet to find a child that doesn’t love spending endless hours splashing in and out of the water at the beach or the pool. As adults are kept busy at the water’s edge reapplying sunscreen and repositioning hats, it’s comforting to know your children’s swimmers will hold up to the task at hand – having fun in the sun. 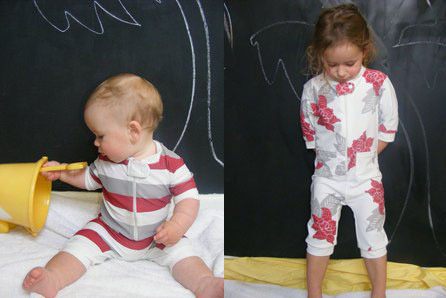 Alfie and Nina are swimwear enthusiasts who have designed a gorgeous coverall swimsuit perfect for little children. The Zip-Up Rashie swimsuit (pictured above) has three quarter length sleeves and legs with a front zip to get in and out of easily. There’s even a press stud enclosure tab to cover the zip pull so inquisitive toddlers won’t be tempted to undress themselves. Alfie and Nina also have a girls one piece suit which is just glorious in the self striped flamingo red or blue with contrasting white shoulder straps and cord bow detail. The boys don’t miss out with Euro shorts that look like they flew direct from the French Riviera and look ever so suave! Alfie and Nina’s new season swimwear is proudly designed and manufactured in Australia using Australian milled and printed chlorine resistant UPF50+ fabric. The Zip-Up Rashie swimsuit is available to fit children aged six months to two years and priced at $49 from Alfie and Nina, plus delivery.